A while back, while perusing Pinterest for Paleo-friendly recipes… I happened upon THIS photo… How cute are these??? 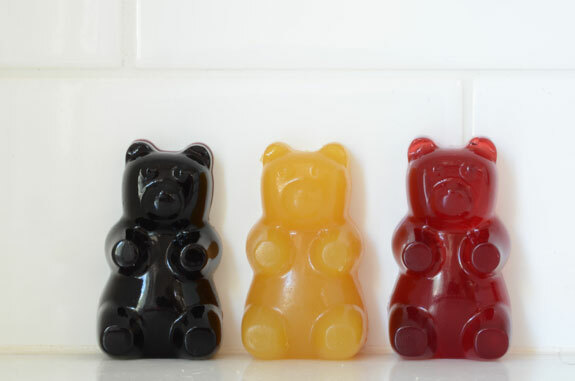 Gummy bears made with nothing more than fruit juice, gelatin and lemon juice! Well, technically her version has stevia in it too, but I chose to omit it. 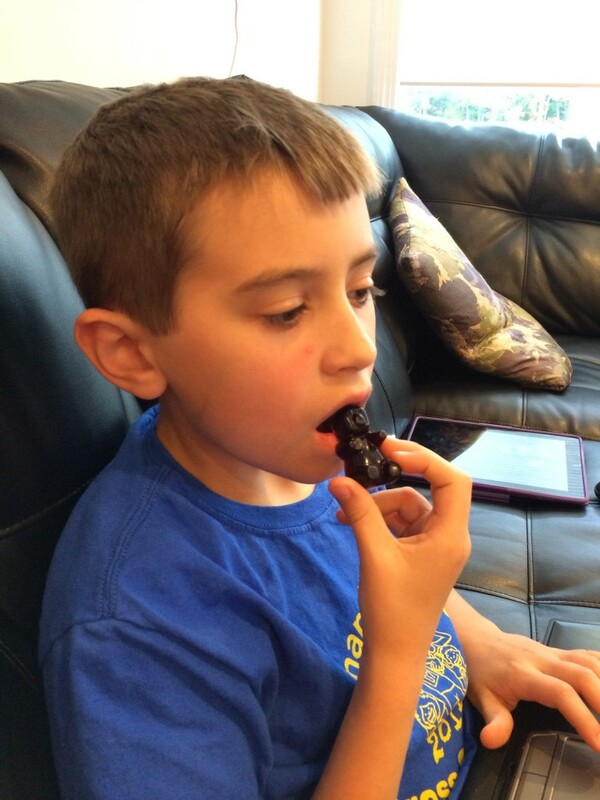 The recipe is located on a gluten free blog I enjoy… Elana’s Pantry. She also has a great little paleo cookbook that I own and like. 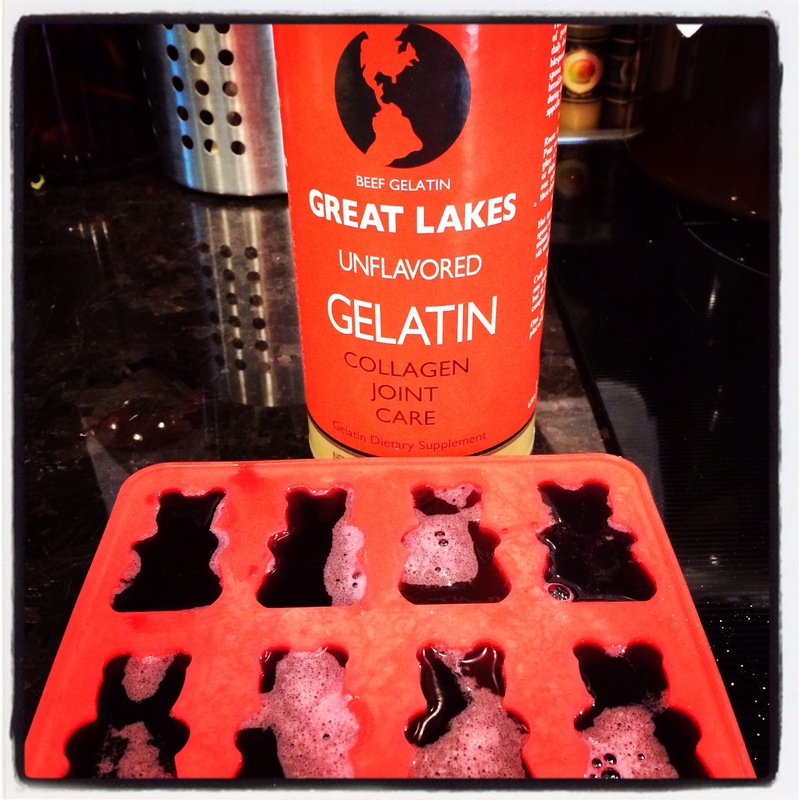 Anyway I was enamored with that photo, so I went online and ordered both the gelatin (must be the RED Great Lakes Unflavored Gelatin to work) and the gummy bear mold (actually, an ice cube tray) she recommended. And they sat in my house for about 6 months. Then, about 2 weeks ago when I was trolling the “New Products” area at my Trader Joe’s, I noticed a new juice they added called “Power of Seven” — a combination of pomegranate, tart cherry, black mulberry, red grape, purple carrot, cranberry and blueberry juice. I bought a bottle because it sounded yummy… and it was. Once home, it dawned on me that I should FINALLY try my hand at those fruit gummies! I grabbed the ingredients and got to work… and the end result was perfect! The first thing I noticed when whisking the ingredients together, is that the mixture gets VERY FOAMY. I tried using the foam in the molds too… but it DOES NOT work. I used a turkey baster to extract just the juice from the pan. This makes filling the molds much easier. You can see a tiny bit of the foam on top of my bears… which is totally fine. 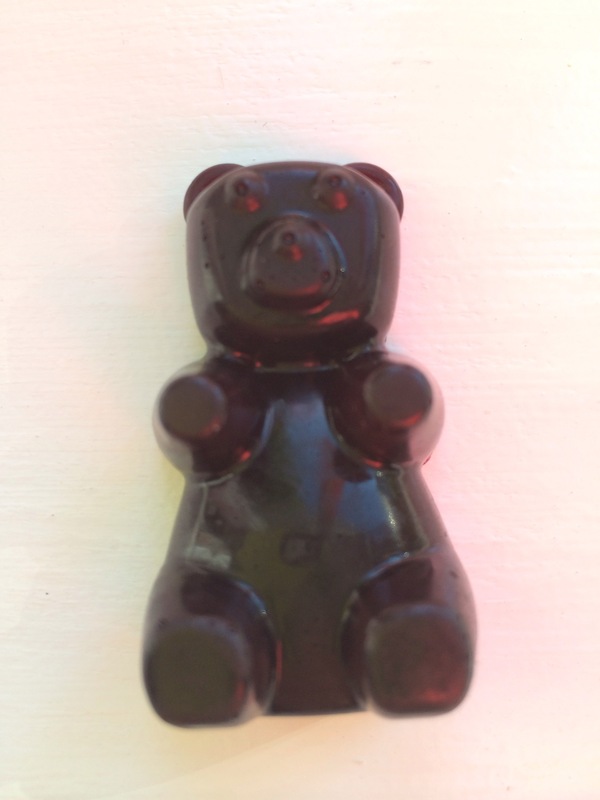 Not a great pic, but after two hours… I had gummy bears! The boy enjoyed them too! I found them very good, but not quite as flavorful as I would have expected. I think the gelatin sort of dilutes the flavor. Next time I plan to add more than a cup of juice to the pan, and then reduce it down to a cup. I’m thinking I’ll get a more concentrated flavor that way. 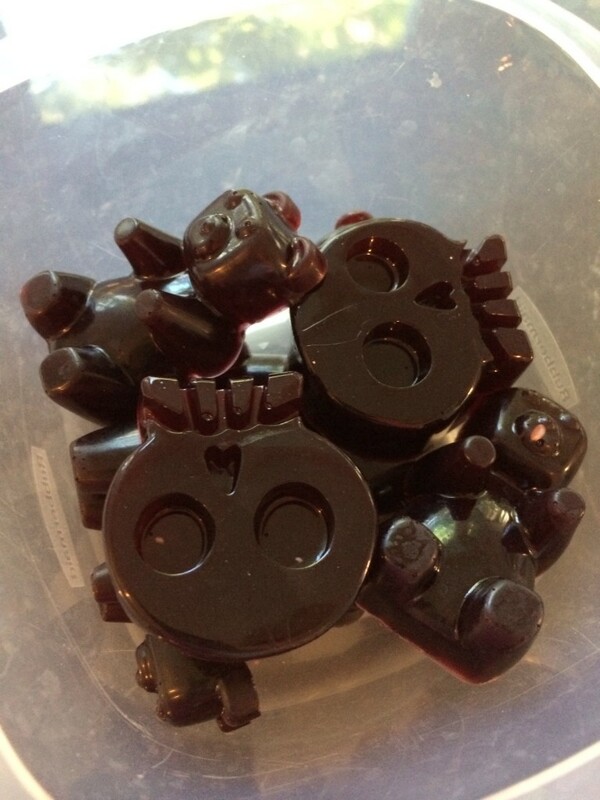 In addition to the gummy bear molds, I also happened to have skull molds… so I made a few of those as well. They were clearly the boys favorite. The texture is great and they kept nicely in the fridge for a few days (which is all they lasted).